The NFL trading deadline is today and naturally, given that coach Leslie Frazier is delaying the announcement of who will be his starting quarterback against the Green Bay Packers until Wednesday, there’s plenty of speculation that he’s doing so to allow the Vikings to try and trade Donovan McNabb. Given how he’s played, you might think the idea a bit preposterous but the Raiders just lost Jason Campbell to a broken collarbone, have Kyle Boller as a back up and supplemental draftee Terrelle Pryor behind him. Even so, you gotta think the best we could get is a seventh round pick. Still, if they could swing it, it’d be a nice clean break to clear the way for Christian Ponder. But until the clock ticks past 3 PM CST today, a McNabb trade is pure speculation. UPDATE: The Raiders have traded for Bengals quarterback Carson Palmer this afternoon, after this article was written for morning email publication. Frazier said his sole criteria for deciding whom he would start would be what is best for the team. That is a rather broad criteria that is open for interpretation. At this point, it’s hard to see how starting Ponder next Sunday is not best for the team. Yes, it would be conceding that this season is done for but it is hard to imagine the Vikings beating the Packers, with McNabb at the helm and the way the entire team played against a beatable Bears team. I didn’t like the idea of trading for McNabb during the offseason when rumors were swirling that a trade was in the offing, but then after seeing McNabb in the preseason and reasoning that the coaches must not believe Ponder would be ready to start immediately, I warmed to the idea. When McNabb faltered during the regular season and fans began clamoring for Ponder, I warned against wrecking him by starting him too early. After seeing him for two series against the Bears, who while they had the game won, nevertheless threw several blitzes at him, it looks like he’s ready to handle the job. He proved capable of dodging blitzing lineman, extended plays with his feet, was far more accurate in his throws than McNabb, he recognized that Urlacher was trying to bait him into a pick yet did not throw one, he had the offense moving pretty briskly, and, did not seem overwhelmed. If what’s best for the team is to move on, the answer is obvious. 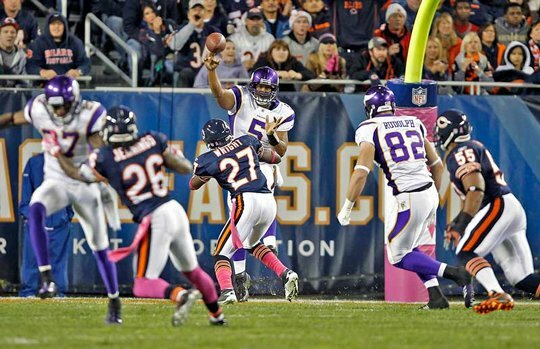 If what’s best for the team is to beat the Packers, I think Ponder gives you as much a chance as McNabb. The expression on Visanthe Shiancoe‘s face after yet another McNabb pass bounced in front of him early in the game spoke volumes about the frustration his receivers must have with him. I wouldn’t be surprised if much of the team is ready to move on to Ponder, too, however great a teammate McNabb appears be. It’s time to see what we got in Ponder. Happy Birthday today to linebacker Xavier Adibi (27)!